Now updated and expanded to cover the latest technologies, this full-color text on clinical refraction uses an easy-to-read format to give optometry students and practitioners all the important information they need. Also covers a wide range of other aspects of the eye exam, including anterior and posterior segment evaluations, contact lens, ocular pharmacology, and visual field analysis. Four new chapters cover wavefront-guided refraction, optical correction with refractive surgeries, prosthetic devices, and patients with ocular pathology. Offer precise, step-by-step how-to's for performing all of the most effective refractive techniques. Presents individualized refractive approaches for the full range of patients, including special patient populations. Contriubtors are internationally recognized, leading authorities in the field. refraction that is required to restore normal visual acuity. 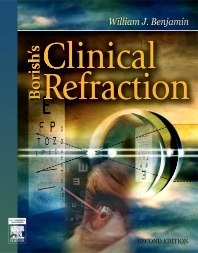 and introduce Borish’s Clinical Refraction, Second Edition. refractive effects of ocular disease. and the analysis and prescription of optical corrections. order to illustrate the basis of my evaluation of this book. the accuracy and the precision of a particular instrument. were used in reconstruction of the corneal shape. various approaches for the display of topographical maps. wavefront sensor is the Shack-Hartmann wavefront sensor. the most appropriate vision aids. critical, comprehensive, and scholarly approach. presbyopes and RGPs) and surgical strategies. we have identified a suitable candidate. conditions is a great concluding addition. patient, in light of their refractive error.